If someone asked me what is the best state to fly fish I’d say Michigan. Yes, I’m bias Michigan is my home state, but with 1000s of miles of water front and awesome public access, I could spend a lifetime fly fishing here and never fish it all. Michigan has a deep-rooted history in fly fishing, I’ve always been surprised that it isn’t more of a fly fishing destination. Trout Unlimited was born here and arguable one of the best flies EVER the ADAMS was created in Michigan. 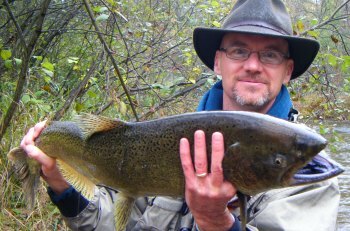 I’ve tapped into local Fly Fishing Guides to provide great spots to fly fish in Michigan. A fly fishing trip to Michigan isn’t complete without visiting the Au Sable River system. The river does get a considerable amount of stocked trout, but don’t let that fool you into thinking it’s easy to hook into these fish. Most of the stocked fish are tiny, so they get to learn the hard way how to survive. The Au Sable will teach you technique and patience. If you can learn to fly fish successfully on the Au Sable, you’ve learned some skills that can be taken anywhere. A great place to spend some quality time on the water is Comins Flats in Mentor Township. Easy wading and great public access make this a great fly fishing spot. Rusty Spinner, size 14 fished in the late afternoon. Mahogany Dun, size 12 fished in the dawn hours. The Manistee starts in some of the same headwaters as the Au Sable. Its water comes from a mix of natural springs and run-off. Because of this it isn’t affected by rains unless a real down pour occurs. The Manistee River has it all; log choked banks, gravel bottoms and holes to float your hat. Accessible to both wading and drift boats this is a fly fishers paradise. Running through miles of National and State forests access isn’t a problem. With so much “fishy” water it’s tough to settle on where to fish. My recommendation is CCC Bridge with the campground. Easy parking and wading this is a popular camping and fishing area so if you’re thinking about staying the night show up early to reserve a spot. Michigan Skunk, a true classic with long rubber legs and a deer hair wing. Zonkers, swung through the deep pocket water. The first stocking of brown trout in the United States was done in the Pere Marquette river. With prolific runs of salmon, steelhead and brown trout a fly fisherman can find something to catch in nearly every season of the year. The Pere Marquette River has abundant aquatic life. It seems that every rock and log will have something crawling on it. Having so much food maintains a balanced food chain feeding everything from minnows to 25-pound salmon. The PM has many great access points in the Baldwin area, a great starting point is of 72nd Street. Pack a lunch and hike into the “Flies Only” section of this river. Eggs flies in size 14-16 are poplar with some much natural reproduction the fish here have keted into them. Beadhead Pheasant Tail Nymphs in size 10 and 12. Drift them deep through the dark pools. An absolutely gorgeous river that in many ways defines a blue-ribbon fly fishing river. Naturally cold from the plentiful springs this river flows through a cedar forests canopy. Brown Trout, Brook Trout and an occasional Rainbow trout love snatching flies off the surface. Webster Bridge Access is a great place to start a fly fishing adventure on the Jordan. Tie on a traditional Adams fly in size 14, treat it to be high floating and you’ll be treated with beautiful white finned brook trout. The White River, is known for as a brook and brown trout fishery. Located in Newaygo County, natural springs provide the cold water that makes this river a true fly fishing jem. Brook trout are found in the headwaters and are best fished using small dry flies like an Adams or Elk Hair Caddis. Make a reasonable “match” with the color and size of fly and these eager trout are willing to play. Farther down river the White turns into a brown trout fishery. In the lower reaches around the town of White Cloud the river is 12 to 40 feet wide and is known to hold a nice population of brown trout in the 2-pound class. Swinging streamer flies like a muddler through the riffles can provoke these hard-hitting fish. Truly a classic Michigan Fly Fishing river. With cedar lined banks and a mix of gravel throughout the river system. Naturally reproducing brown trout dominate the main river, while a bounty of brook trout can be found in the feeder creeks. The Boardman is located in Grand Traverse county and empties into Grand Traverse Bay at Traverse City. A great stretch of water is above Brown Bridge Dam. Toss flies to a healthy population of trout in the 10 to 13-inch range. Known locally as “The Dawg” is a feeder river to the St Joseph River in Van Buren County. The best fly fishing can be found outside the town of Niles MI. With a nice gradient and easy wading, the Dowagiac is only limited by access. A good steelhead run in the Spring and resident brown trout make swinging streamers the primary means to hook into our finned friends. Crayfish are abundant throughout this gravel bottom river so keep that in mind when selecting a fly. The Huron River is easily accessible to millions of folks but isn’t fly fished as much as it could be. With a good gradient and moderate water temperatures; smallmouth bass, pike and seasonal trout can all be caught on a fly. Located in Livingston and Oakland Counties the Huron river has great access with the many parks along its banks. Some points of interest are just north of Wixom in the early spring when breeding stock trout 8 to 25 inches are stock just for fly fishermen. Another area is downstream from Barton Pond over by Ann Arbor with abundant Large and Small Mouth Bass, Pike and Sunfish. A true hidden treasure for fly fisherman willing to explore. Predominantly a cold-water fishery above M55. I hate saying much about this river because I own a little stretch of streamside on this river. So, let’s just keep this river a secret between you and me. This river is best fished by floating in a canoe or pontoon boat and stopping to wade at the traditional riffle/run/pool water structure. A great access spot is at Sage Lake Road just south of Rose City. The river isn’t very deep, but the cobble stones make for difficult wading. Bring two fly rods to fly fish the Rifle. With one fly rod tie on a streamer to swing through the fast water. With the second fly rod rig up a dry fly with a dropper nymph like a green caddis to drift over the woody structure. Is a typical Upper Peninsula river that perfectly fits the fly fisherman’s definition. It is classified as a blue-ribbon trout stream for 18 miles above the M-28 Highway Bridge in Seney. County Road 450 parallels most of this stretch providing excellent access through the State Forest. The Fox can be narrow and deep so wading can be difficult. An excellent option for the fly fisher is to use a small pontoon boat with oars or a canoe. The perfect setup for the fly fisherman is an 8 foot 6 inch, 4-weight fly rod with a terrestrial like a grasshopper or beetle. Michigan has a bunch of river called “Black” but when you add brook trout plus fly fishing in the same paragraph your talking about the “Black River” in Otsego County. A great section can be fly fished above and below Tin Shanty Road bridge. This is a tight meandering river about 20 feet wide. Eager brookies abound in this cold river so tie on an elk hair caddis size 12-16 or high floating parachute Adams in size 14. The Black River has provided some trophy brook trout to folks tossing smaller streamers that imitate the many chubs found in these waters. I would recommend two sizes of fly rod to anyone coming to Michigan. The first would be a 3 or 4 weight rod – even better would be the TFO Drift Fly Rod which can be switched to fish either dry flies or nymphs. Talking to Brian Kozminski from True North Trout. He recommends a minimum 6 weight rod like the TFO BVK or AXIOM II for Mousing and Hex fishing. Plus this these rods can swing streamers into deep woody debris and undercuts. You can find Brian and the rest of the team HERE at TRUE NORTH TROUT.